Custom Engineering | Wiggins Lift Co., Inc. When a marina owner or operator wants to buy a marina lift, the first question is usually “what capacity?” How big of a boat does it need to lift, and how high? The answer to that question is not as simple as one might think. In our last post (“A Brief Note on the History of Marina Lifts and Capacity”), we discussed how the terminology for forklift “capacity” was not developed with boats in mind. In brief, the 36” or 48” “load center” terminology was not coined for lifting boats. Boats are heavy in the stern, light in the bow , and longer and narrower that regular forklift loads. Manufacturers began to specific 96-inch load centers (eight feet), yet even as early as the 1990s, boats had 10’, 12’, and even 15’ load centers. Accidents happened because of the lack of an easy and precise terminology. The problem was exacerbated when marinas began asking to lift 40- and even 50-foot boats. Some manufacturers began using 144” load centers (12 feet! ), but this didn’t solve the problem. Operators just want to move boats, and do it safely. Using a 96” and 144” load center capacity is not the easiest or most precise terminology. Because boats are so long, with unusual weight distributions, they place heavier stresses on the carriage, mast, and forks of a marina lift than regular forklift loads. Wiggins spent many decades thinking through all these issues. We constantly research, test, measure, and innovate. We engineer, design, and construct our lifts to the largest boat a customer needs to lift—not to a 96” or 144” load center. Easy for you, standard for us. We use two capacity terminologies: the common “load center” (because it is expected), and a more precise and easy measurement of capacity called MIPs. In the real world, no one is lifting a boat that weighs 35,000 pounds with a 96” load center (they don’t exist!). A 35,000-pound boat might have a load center closer to 240” (20’). A better measurement of the forces a boat will place on a lift is “millions of inch-pounds” (MIPs). An “inch-pound” describes how much force is exerted by a boat on a forklift per square inch, and takes into account weight and torque when turning or braking. How do you figure MIPs? If you have a Marina Bull W8.4 M2, and a boat arrives at your marina that weighs 36,000 lbs with a load center at 216 inches, can you lift it? Multiply 36,000 by 216 to get 7.8 MIPs—then get out there and move that boat with complete confidence! Wiggins model numbers are based on boats, not an out-of-date 96” load center. Do you want to know if a competitor model compares to the Wiggins W 8.4 M2? They might tell you that you need their model 600 which has a capacity of 60,000 lbs at a 96” load center. Will it lift your boat? Maybe, but how do you know? First, there is no 60,000 lb boat over 50’ long with a load center at 8’! Second, did they design the carriage, mast, and forks for that much boat? In order to lift the same boat as a Wiggins M8.2, you might need a lift of larger capacity from our competitors, because many manufacturers use the same carriage, mast, and forks across a family of marina lifts. Wiggins builds our Marina Bulls to lift the largest boat you need to lift, and provides an easy formula for safe lifting capacity. A measurement that ensures the safety of your lift, your facility, your employees, and your customer’s expensive boats. We will delve into the details of load capacities, strength of components, and MIPs in future posts. Join our mailing list to keep up! “Innovative Business of the Year” Award for Wiggins Lift Company, Inc. The Oxnard Chamber of Commerce presented Wiggins Lift Co., Inc. with the “Innovative Business of the Year” award at its 65th Community & Business Awards Luncheon on Friday, June 26, 2015 at 11:30 at the Courtyard by Marriott Oxnard. The WigginsW36-24LCS-89 SS3—a unique forklift designed for use in heavy seas aboard the Navy’s high-tech Littoral Combat Ship. These ships are U.S. Navy special vessels designed to operate in heavy seas and an environment where industry-normal forklifts could not function or even survive. Wiggins came to the rescue with innovative design and custom engineering. For more about Wiggins military lifts, click here. To read more about our custom engineering, click here. 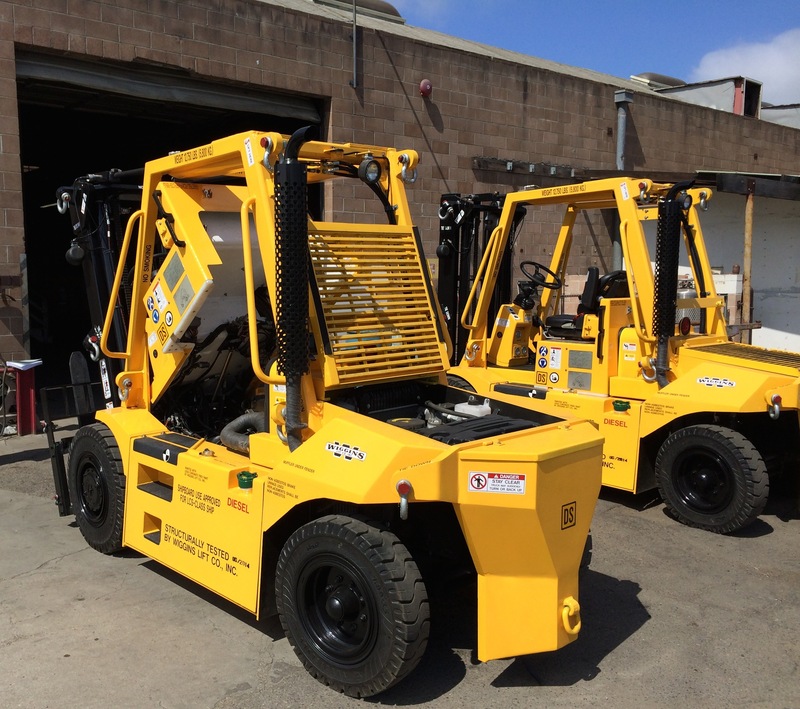 Below: Two Littoral Combat Ship forklifts sit outside the Wiggins Lift manufacturing facility in Oxnard, California, awaiting transport to the US Navy.